What is managed hosting? In the IT world, “hosting” refers to buying space on servers for a specific purpose. It can also include leased hardware associated with the hosting service. There are many different types of managed hosting services a business or client can purchase in order to help grow their business. The key is finding the right services. Most managed hosting services relieve the client of the majority of maintenance work, taking over the role as administrator of the hardware, operating systems, and system software. Clients typically have administrative access, but it is rarely used as the data center or secure hosting provider takes care of any tasks necessary for administrative access. Depending on the hosting package and provider, your managed hosting package can include various additional features and options. This can include various services, such as increased security hosting, recovery options, backups, DaaS, SaaS, IaaS, e-mail hosting, and more. It’s important to remember that not all hosting companies are the same. Strong communication, qualified expertise, and dependable technology in an environment that fosters optimum performance are all crucial to a secure hosting service. Without it, your business can suffer irreparable losses, which is why quality matters when dealing with your precious data. Thankfully, SkyLink Data Centers offers all of the above and more. Our certified IT professionals take our services a step further by giving your business multiple hosting solutions that can be combined to fit your needs. Our encompassing hosting packages were created to free you from the tedious task of managing technology so you can focus your time and money on your core business. They include standard Managed Hosting, Cloud Hosting and a combination of both through Hybrid Hosting. We help you select the right solution by listening to our clients and learning about their unique business needs. It Reduces Your IT Expenses: You’ll leverage our IT staff and expertise to manage all the day-to-day technical tasks of maintaining yours systems, backups and more. SkyLink is Completely Carrier Neutral: We are able to provide fully redundant, high bandwidth, aggregated Internet connectivity across multiple carriers via independent routes. We Offer Fully Customized Solutions: The flexibility of our custom solutions allow you to choose from a broad range of services and technical offerings to create the optimal hosting environment complete with add-ons. These include firewall, load balancing, intrusion detection, system monitoring, backups and other great features. Our Hosting Solutions are Flexible and Scalable: Our managed hosting offerings include dedicated hosting of anything from simple websites, eCommerce stores and email to entire web applications, mobile apps and rich digital media sites to include workload distribution and private connectivity between platforms through Hybrid Hosting. We are the Definition of Reliability: Our hosting solutions are located in storm hardened and protected facilities with fully redundant power and cooling that provide the 100% uptime our customers require. You Receive Full Compliance and Security: Our Managed Hosting solutions are ideal for applications that require the additional security necessary for PCI and HIPAA compliance initiatives. We Deliver Around-The-Clock Monitoring: All servers, systems, infrastructure and facilities are monitored (complete with video surveillance) 24x7x365 to preemptively notify our technicians and engineers of impending performance issues, service outages and hardware failure. 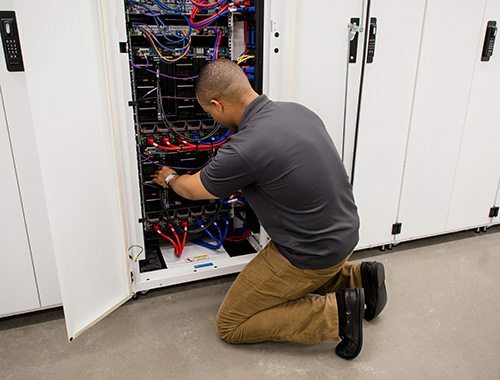 We do our diligence to prevent any downtime or loss of service. Hosting Services vs. Cloud Services: With the rise of the cloud into today’s business realm, some may be wondering how traditional hosting services differ from the new cloud hosting alternative. Is it cheaper? Is it better? Find out the details in this SkyLink article. Protecting Your Data in a Hurricane: Security isn’t just about protecting your data from digital attackers. See what SkyLink does to make itself one of the safest havens for servers in the state of Florida, come wind and high water. The Advantages of Leasing Your Hosting Equipment: Trying to decipher whether to buy, lease, or use your own hardware for managed hosting services? Before you decide, take a look at this article detailing the advantages of leased equipment, and how it can help you save money and grow your hardware with your business. What is Cloud Storage? : Not sure what cloud storage is? You may be surprised to find there are various types, all with their own unique storage options. Find out more about what this Internet based tool is, and whether or not you should take advantage of it. A Panel’s Advice on Infrastructure, Web, and Security: There’s a reason you look for “secure hosting,” and not simply hosting. Security matters, and it requires vigilance both in your infrastructure, your web activity, and general security measures. Learn what you as a business can do on top of SkyLink’s managed hosting solutions to keep your data and your hardware safe from intrusion. Contact us to discuss business hosting services, data management and more.